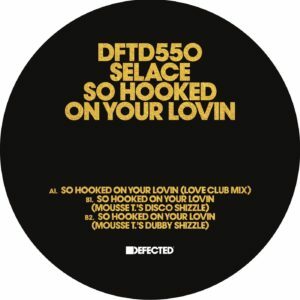 One half of iconic British duo Basement Jaxx Felix Buxton and vocalist Gia make their Defected debut with the soul-stirring ‘So Hooked On Your Lovin’, alongside two groove-loaded remixes by Mousse T.. The first ever release under their Selace pseudonym, the record comes laden with lingering organ chords and stunningly raw vocals, echoing the stripped back quality of Switch’s ‘I Still Love You’ and with a similar deep-reaching feel to Massive Attack’s early 90s classic ‘Unfinished Sympathy’. Production maestro Mousse T. works his magic with his funk-drenched Disco Shizzle mix loaded with a pumping bassline and guitar riffs alongside a deeper Dubby Shizzle version laced with a spoken word hook. Less is more with Selace; this is a minimalist yet undeniably stunning record that lets its captivating song do all the work.